When Case put together the case 320 TLB was it designed with the correct components? That is was the platform tractor used ( I think a case 300) heavy enough regarding rear axles, diffrentials, and front end parts? Picture is just like my 1057 case 320. Case Nutty provided the picture. 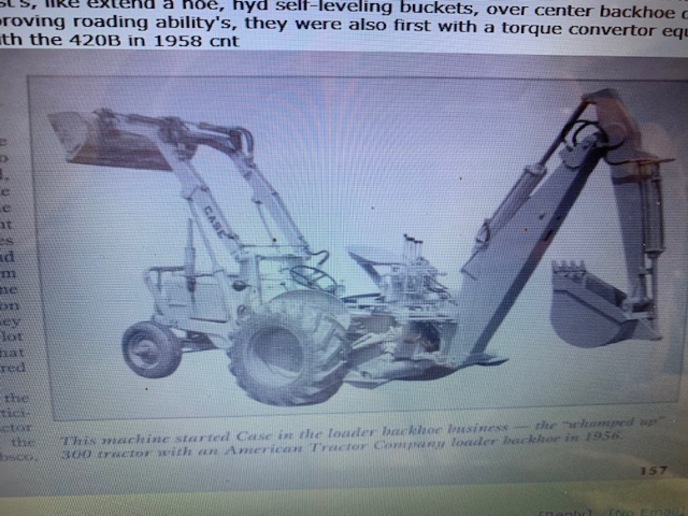 Mine has been used on the farm for such things as: clearing fence lines with the backhoe, digging ditches , and piling brush for burning with my home built thumb. Case 320 I have, seems to handle the backhoe and front loader well without problems. Nothing but the name is the same on a 580E compared to your 320, 580E is a component machine, meaning it has a one piece subframe that the loader and back backhoe mounting points are one piece, the transaxle can be dropped out of them in no time, this made a lot stronger machine than the way the 310-580B machines were made by them bolting on the loader and hoe to a existing tractor frame, again Case pioneered this design in the 680's another reason Case is the leader in tlb's, they did however use the knowledge they learned starting in 1956 to continue to improve on the design. I certainly agree with You that nothing but the name on a 580E is the same as on my 320. I was referring to a diagram of the trumpet ( axle housing) on the 580 E and the same diagram of similar parts on my 320. and the two bearings on the axle and two seals: one bearing on the inside plus seal, plus a bearing on the outside plus seal. I have decided to leave the seal alone. Imagine when parts for customer machines are broken during disassembly new parts are probably readily available. Hitting parts with a maul to disassembly things has never been my way to repair equipment.
" We have a special tool to remove the bearing in order to remove the axle shaft. Suggested that I might be able to borrow the tool" Said I could look at the tool on the internet regarding special tools to work on Case Tractors. Contacted Case Customer service they referred me to case construction dealerships.I like to spend time looking up things on the internet. We have a collection of farm tractors we have restored. Our collection includes one case, the 320. Other tractors are John Deere, International, and ford. Thirty minutes to replace the inner seal on a 320 demonstrates excellence. This is where I run into problems; Axle housing with axle inside plus inner and outer bearing is together as a unit. You mentioned that the housing comes off but doesn't work for me. Need to burn the inner cone off the axle, then I think the axle housing will slide off the axle. From this point I would be able to remove races, outer bearing plus race and two seals. Will just put back together and let the small leak continue. I just got back to where we keep out 320 case industrial. You were correct about there being grease fittings at axle ends, I was wrong. They were totally hidden by old dried grease. Secondly the differential has about an inch too much 90 Wt in it as measured with the dip stick. This might made a small leak out the axle ends. Secondly: You were correct and I was wrong.Just checked the rear axle housing outer end on our 320. Zerk fitting there both sides just covered totally and hit with dried grease. Transmission dip stick shows too much oil in the transmission differential. Milky color so need to change and add new.